From the countless impressions that our senses record, we create a story and a sense of self: What we like, what we loath, who we are, how we are. We hold this sense of self in language, story and belief. Endlessly, we seek a consistent sense of self, one that includes that which supports our self-talk propaganda, and we push to just beyond the edge of awareness all that doesn't fit the official story we tell ourselves. But physiology does not forget. The body also works around pain and injury, finds ways to compensate and adjust. This is why we sometimes have physical issues that seem to come from nowhere, and fail to resolve with usual treatment. Too often we direct treatment at the location of a symptom, but not at the location of the problem. What makes the problem even more entangled is that the compensations and work-arounds we have successfully taken may now be the source of the very issues we are striving to resolve. Why? Because physiology does not forget. It's easy to focus on the negatives. And when selling a solution, it's profitable to work the archeology of a problem. That can be helpful and productive, as well. But it's just one side of the illness/wellness coin. So often buried, lingering traumas resolve naturally when brought back to the light of day to be integrated, instead of compensated for. And this is a reminder that our physiology doesn't just remember only trauma — it also remembers joy, delight, ease and beauty. Sadly, these are easy to overlook in our world that conflates cynicism with smarts, mistakes pessimism with an adult clear-eyed view of reality and fails to recognize how beauty and connection also affect our physiology. We forget (or perhaps we have not been taught) that exposing ourselves to the eerie beauty of nature, allowing our nervous system to bathe in the warmth of love and community, breathing deep the connective moments of synchronicity and allowing an unbridled sense of awe to infuse the mystery of our being all deeply touch our physiology with a quieting, connective influence. 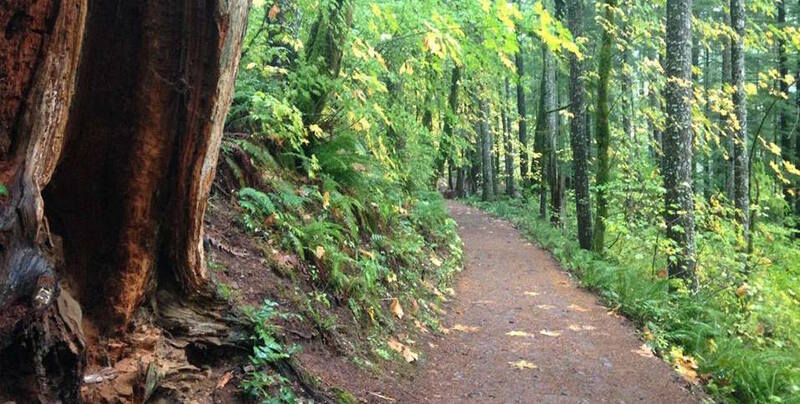 It is helpful to heal the hidden strains our physiology has stored over the years, but a focus on trauma alone leaves out the redemptive moments that can arrive only by opening our experience to that which is connective, beautiful and joyous. These, too, deeply touch our deepest structures of the body and the mind, and they work unseen miracles in the dark. It’s that season of oddball temperature changes and diminishing light, which means more colds and cases of the flu. Ever wonder why there are more respiratory illnesses in the fall and winter? And don’t go pointing at “germs,” because we all live in a soup of bacteria and viruses. It has more to do with the climatic changes and our body’s ability to cope. That’s a familiar sentence, though when you examine it, it seems odd that a climatic assessment has come to define an illness. “Cold” is the problem here. And remember, the presence of viruses does not explain why some people get “colds” every year but for others it is a rare event. Chinese medicine explains it rather nicely. It has to do with the health and strength of your lungs, which in turn have a lot to do with the skin’s ability to regulate your body’s response to heat and cold. Once a chill gets deeply enough into the body, it creates a situation where opportunistic viruses and bacteria can get a foothold and cause their mischief. One of the easiest ways to protect yourself from a chill is to protect the back of your neck. This is often the area that feels discomfort at the very beginning of a cold. Don’t ignore your body’s signal that this area is vulnerable — start by keeping the wind and cold off your neck and shoulders with a warm scarf or a jacket with a stand-up collar. There are a couple ways to do this: One is by using your knuckles to lightly rub and warm up the Lung Channel. Try it for a couple of minutes a day, every day, and also when you are feeling a bit rundown. The other method, Gua Sha, is not only found in Chinese medicine, but in the older medicines of many cultures. This safe and easy treatment improves local blood flow and helps to expel cold from your skin and surface tissues. Do this over the area of the lungs at the very beginning of a cold to help prevent it from taking hold. Get the details on how to do Gua Sha, and watch a demonstration on the blog. 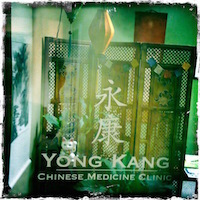 Yong Kang Clinic or the Newsletter? Now you can tell the world! I would really appreciate it if you would take three minutes to share the value you get from the clinic or the newsletter by leaving a review on either Google or Yelp. This helps others to find the goodness that you find here. How do I know that acupuncture will help me? You don’t. I don’t know either.It’s like any other process of discovery and intervention. We first strive to understand your present situation, what brought you to this point, what holds your current condition in place. Acupuncture and Chinese medicine seek to understand not just the mettlesome symptom that led you to pick up the phone for an appointment, but to get a sense of how these symptoms and annoyances fit like puzzle pieces into the rest of your life. This approach is unlike the currently popular “evidence-based” medicine model of lining treatments up with symptoms and letting researchers’ data or insurance company policies decide on the best treatment for you. Chinese medicine is an observation-based medicine that seeks to understand each individual, his or her unique situation and how that fits into the greater context of a life. Also, acupuncturists don’t look to “get rid of the problem.“ Instead, we seek to understand the problem — and then help to either strengthen the innate resources a person has for self-healing or seek to alleviate symptoms so the body has an opportunity to fall into its own best balance. Usually, we craft a treatment that both works on the root causes and the symptomatic mischief that caused you to reach out for some help. Will acupuncture help? As with so much in life, you will not know until you give it an honest try. (An “honest try” being at least 4 to 6 treatments.) Remember, while acupuncture may seem exotic, it is medicine, not magic. Just as you would give your physical therapist a month or so to correct a problem, give a surgery several months to heal, or a course of pharmaceutical drugs 6 to 8 weeks to see if you respond well, so too it takes some time to understand how you will respond to acupuncture. with a member of the Yong Kang community. I should also mention I have gotten rid of grains in my diet as well – which I rarely ate anyway. The muffin top that has attached itself to my midsection was the motivator to change my diet. I knew I was dipping into some chocolate in the late afternoons. I have more energy than I know what to do with, I've dropped 8 pounds and my midsection is thin again. (I have not been this light in 20 years) I do not crave any sugar or grains and I am not hungry! 85% dark chocolate tastes sweet. My palate has come alive and things taste better. There are two things about this conversation that really stand out to me as a health care practitioner. The first is the comment about realizing the amount of sugar that was disguised in other foods. And the second about the palate came alive and things tasted better without the addition of sugar. It's true, our food supply is deeply contaminated with this additive. And if you don't think so, just try finding something, even something with the label “healthy” or “natural” and notice the amount of sugar that's in it. And the second part about how the taste buds changed. Yes. They do. And once they do, the sweet flavors you now find pleasant actually become distasteful. And without all that extra sugar in your system, your metabolism will change as well. Weight loss is a common side effect, as is an increase in energy and mental clarity. The above is not a testimony for the Journey Beyond Sugar process that will start toward the end of October. But people who have been through the process have said similar things. The Journey Beyond Sugar process is a distillation of my clinical work, the ancient wisdom of Chinese medicine, modern metabolic science, mindfulness practices, the principles of neuroplasticity and the joy we always get when we get curious about something and explore it. Join the Journey! Sign up here. as in receiving what we believe to be our due.